Well, THAT would have taken me a long time to find in the VS interface! Thanks for your post. I'm assuming some kind of .NET patch threw the versions out of kilter; my error message actually said "...does not match the .NET Framework launch condition version 3.5.21022" so I'm assuming it's not specific to the version you mention in your post. Nice find. I had this problem when upgrading a Visual Studio 2008 project to 2010. The targeted framework version was '3.5.30729' and just needed to be changed to '.NET Framework 3.5'. This article saved me a lot of lost time! Thank you very much, this saved me a lot of time. This resolved the initial error as described in your post, but a subsequent warning was generated: "WARNING: The version of the .NET Framework launch condition '.NET Framework 4' does not match the selected .NET Framework bootstrapper package. 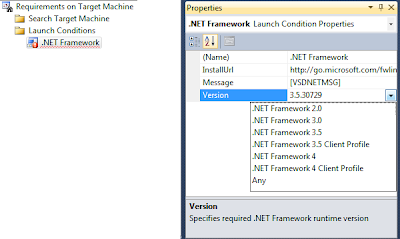 Update the .NET Framework launch condition to match the version of the .NET Framework selected in the Prerequisites Dialog Box." To resolve this one, you need to select the Installer Project > right click > properties > prerequisites and then correct which version should be selected (should be the same as in the Launch Condition Properties). I had this error after upgrading my project from 2008 to 2010 Specificly the to target dot net 4.0. Even after updating the installer dependency the warning still kept popping up. To resolve it I had to close and reopen the project. Strange piece of cached info maybe that's why the autodetect didn't work either. Thank you very much. While my problem wasn't completely solved by this, it sure did help. After having this issue today too, I followed some of the advice in this post and then looked a little deeper at the actual project file configuration (.vdproj file) and located where the problem was. It seems that both Debug and Release configurations both have to be configured correctly otherwise you will get this warning. I have outlined all the steps to prevent this warning below. WARNING: The version of the .NET Framework launch condition '.NET Framework 4' does not match the selected .NET Framework bootstrapper package. 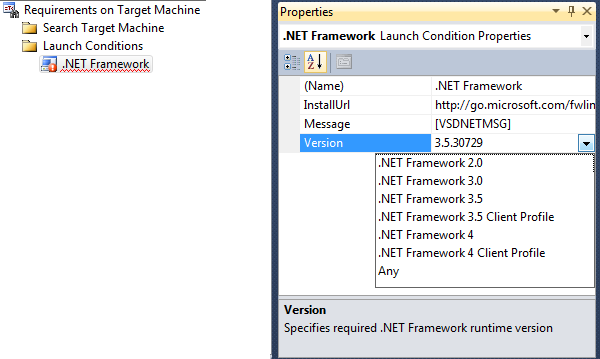 Update the .NET Framework launch condition to match the version of the .NET Framework selected in the Prerequisites Dialog Box. Build the setup project and the warning should now have disappeared - I found the last steps (8-12) solved my issue and saves having to directly modify the .vdproj file manually. got the same problem after upgrading a solution from VS2008 to VS2010. Your find saved me a ton of time! Your post is still providing value!